Beefy workspace – It fits (and supports) TWO 24” monitors with separate pedestals plus a development laptop, with surface area to spare for storing other papers and things. I also have additional space on the desk below the Varidesk. 2-level design – It has an ergonomic upper & lower shelf design so you can protect the angle of your neck and elbows. It’s sort of like a built-in keyboard tray (though non-moving). Note: I’m 5’8”, and I could also use a small monitor riser to get the neck angle just right, but it’s close. Fits on existing furniture – One of the most appealing features is that you can add the Varidesk right on top of existing furniture (desk or table), so there’s minimal shuffling or cleaning house you have to do to get going. This translates directly into less weight & price for the desk as well. But this also causes some issues (see Gotchas below) if you don’t have the ideal base furniture. 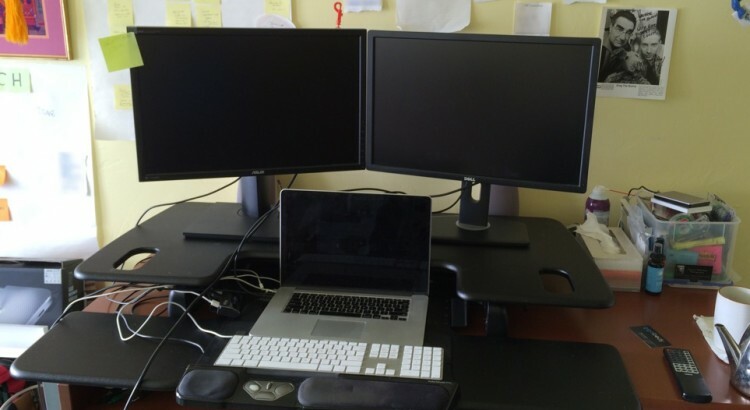 Solid engineering – Raising and lowering the standing desk is smooth, easy, and very stable. The unit comes as one piece, pre-built and while it is understandably bulky, it’s not so heavy or huge as to be unmovable by one strong person if necessary. It’s entirely mechanical, not electrical. 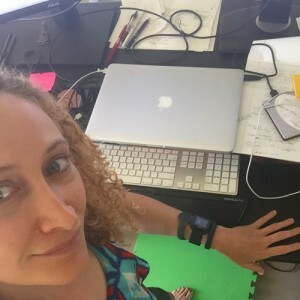 Potential ergonomic issues with some types of existing furniture – Turns out it’s REALLY important what kind of desk/furniture you’re putting the Varidesk on, if you want to preserve an ergonomic workspace. Chair height problems – The desk below my Varidesk has non-removable casters, so I cannot lower it. But my standard office chair does not reach the Varidesk on top of my existing desk. My hacky workaround is to use a stack of firm fitness mats below my chair to raise it about 4” so I can reach the Varidesk. I have been unable to find a standard ergonomic office chair *with arms* that is tall enough – the closest solution is an architect’s drafting chair, but they rarely have arms. There is nothing special about the height of my base desk or chair, and having to sit on non-solid mats is uncomfortable. Knees blocked by previous keyboard drawer – My base desk has a built-in keyboard drawer, in the spot where my knees would now go to fit under the Varidesk. So, I can’t sit with my knees under the desk anymore. I’ve pulled the Varidesk forward as a workaround. It’s not ideal. Messy cords – A minor issue, but cords do occasionally get in the way or get caught under the standing desk when it’s lowered. 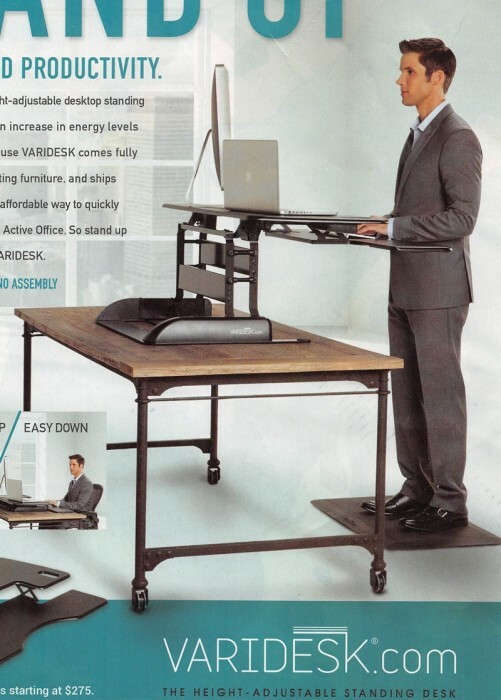 The ads for standing desks (such as the one below) alway show a perfectly cord-free workstation. Alas, real computers still have cords and wires. Using a standing desk, regardless of which type you buy, turns out to be a mixed bag. Even after months of use, the benefits of a standing desk are not immediately obvious to me. I am not more productive, thinner, or more energetic, but it seems like common sense that sitting for fewer hours every day will add up to be a good thing long term. I do feel physically warmer and my resting heart rate runs a bit higher while standing than sitting. I intuitively dance a bit when I hear music while I stand, which I enjoy & simply does not happen when you sit. I often dread standing at the desk when I first see it. Standing on tired or sore legs is just not fun, and is often the case for me because I work out every morning before work. I can stand for 2-4 hours at a time typically, then I need to sit. Shifting my weight frequently gets me that far, but not farther. I stand on 2 firm gym mats as anti-fatigue floor support, but perhaps a standing-specific mat would be better. In short, a standing desk is not a magical life improvement. It’s actually a task requiring some willpower, energy, and long-term goal thinking. Given the affordable price and feature set of the Varidesk, it may be a worthwhile investment for you if you sit long hours at a desk. 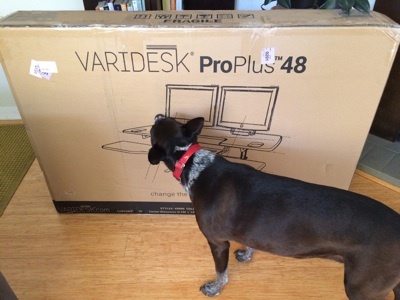 Do your homework to assess whether the Varidesk will work with your pre-existing furniture. If you have a tall desk or table, a desk that is not height-adjustable or has non-removable casters, Measure, Measure, Measure. A standard office chair may not reach the Varidesk on top of your existing furniture. If you have a non-removable keyboard shelf or drawer on your original desk/table, your legs will not fit under the desk anymore. Know that adding a standing desk on top of existing furniture is not necessarily easy to get right. You *will* face a bunch of minor issues to convert an existing workspace into a standing workspace: cords and cord length, layout of surfaces, monitor placement, readjusting heights and angles for ergonomics, figuring out which things are safe to put on the moving part of the desk and which are not (speakers, drinks, office supplies, etc.). If your experience is like mine, a bunch of hacks will be required and it will not be perfect. I’d like to see Varidesk be more transparent about the limitations of their standing desk design with existing furniture. They could offer a guide to help potential buyers measure and assess their current furniture’s suitability for a Varidesk. They could also provide links to extra-tall office chairs, monitor risers, and successful hacks that people have used to get the Varidesk just right for them. Have you tried a standing desk? What has your experience been like? What size monitors do you have on your desk? Do you find the unit shakes or moves while typing in the standing position? How tall is your current desk and how tall are you? my apologies, just noticed you already answered a couple of my questions in the article. Sorry!